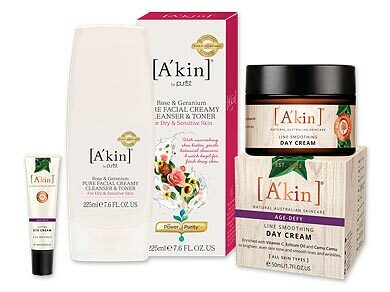 A'kin was founded in Sydney, Australia by cosmetic chemist Will Evans in 1997, who wanted to create natural, safe and effective skincare products free from any nasties. A'kin produce a large range of highly effective natural skincare and haircare products that have won numerous awards. A'kin's philosophy is 'The Power of Purity', they use the finest quality, 100% nature-based ingredients using rich concentrations of active botanical ingredients to deliver radiant, healthy looking skin and hair. Taking a holistic approach, A'kin do not use Parabens or Sulfates in any of their products. They do not use any animal ingredients and do not test on animals.